Depending on how long you've called yourself a gamer, you may be intimately familiar with classic PC RPGs like Baldur's Gate and PlaneSc ape: Torment. It's also entirely possible you've never heard of them. I personally fall somewhere in the middle as I did play games like these, I just happened to be ten years old and completely unsure of what I was doing. Even so, those classics made an impression on me, one that has informed my taste in games until this day. Pillars of Eternity: Complete Edition caught my eye and had me wondering if this classic form of RPG still held up to modern standards and expectations. Now that I've sunk a lot of time into the title, it's time to find out if these pillars hold strong or crumble into dust. Pillars of Eternity harkens back to the time when RPG storytelling was rich, full of lore, and incredibly creative. That's not to say that modern RPGs don't possess this level of storytelling, but there's something satisfying about the eloquent and verbose vocabulary that oozes from every line in this Pillars of Eternity. The game has a Shakespearean mastery of the English language, and this is due to the extremely talented writers at Obsidian who penned the game's script. That being said, you'll need to be prepared for a lot of reading. Even small interactions feature entire paragraphs of text. Conversations branch out into numerous paths, and dialogue is accompanied by descriptions of the speaker's mannerisms and actions. On the surface, the story may appear to be standard fantasy fare, but it is anything but. For starters, the character creation is one of the most interesting approaches I've seen as a gamer. Instead of spending hours adjusting your jawline, Pillars of Eternity: Complete Edition has you choose your basic parameters like race and class before then crafting your backstory and your culture. You build your character from nothing, and the options are extremely compelling. For example, I chose a race called Godlike and a subrace that made me associated with the god of death. Classic options like humans, dwarves, and the like are here, but the options expand beyond what you'd expect. Your choices inform aspects of your attributes, your starting gear, and how characters in the game interact with you. It's not the most detailed character creation from an appearance perspective, but from a narrative one, it's by far the most detailed I've seen. Once you step into the game's world, the main story doesn't take long to get interesting. You soon find out that you are a Watcher: someone with the ability to gaze into the souls of the living and the dead. You can commune with spirits and even glimpse at fragments of your past lives. The storyline in Pillars of Eternity: Complete Edition effortlessly introduces new concepts, rich history, lore, and both political and supernatural elements. The side quests are especially engaging, offering plenty of deep and interesting tales to pair with the main narrative. Should you so desire, you can customize your own party, but I went with the people I came across and recruited to my cause. Each of them had their own backstories and goals that I could help them achieve. For example, one was a dwarven woman on a quest to find the reincarnated soul of a great leader who ruled over her people. The only real downside to Pillars of Eternity's story is that it's a lot of reading. For me, that wasn't too much of an issue, but it's worth considering if you're someone who prefers voice acting across the board. The game does feature some voice acting, but much of the text is not narrated or voiced. Even so, you should absolutely explore every crevice the game has to offer. Even the random people you can gaze into and learn more about have great stories to tell. When you boil down the story aspect of this game, there's no denying that it's impeccably written and beautifully told. There's no shortage of depth for those who seek it, and the game's encyclopedia keeps the lore organized for you throughout. It has all the trappings of a great fantasy tale, but it stands out from the rest by offering plenty of unique elements, such as the Watchers and their soul-gazing abilities. For those looking to experience a deep and profound tale, you will not be disappointed. Pillars of Eternity: Complete Edition offers several difficulty modes, ranging all the way down to a mode purely meant for experiencing the story. Even so, the combat will most like confound anyone who hasn't played a game like this in the past. By default, the game pauses when combat begins. This allows you to issue commands as you see fit and unpause when you're ready to start. You can also stop the game to issue more commands as you see fit. Making the leap from the PC to the console, the game switches over to radial menus that allow you to select skills and abilities. It can be overwhelming at first, and you'll probably be tempted to just send everyone in for the attack. Even on the lower difficulties, this is not going to work for the long term. You'll need to get comfortable with structuring your party into a formation that plays to their strengths. Archers should not be up close, for example. The huge number of status effects, skills, classes, and enemy types will be overwhelming at first. Consistently referring to the in-game codex and bestiary will help you better understand and formulate your strategies. Skills will play a bigger role than your equipment for most characters as well, which is going to take some getting used to for those who are RPG purists. AI options allow you to remove some of the micromanagement, but higher difficulties will demand that you pause to recalculate your strategy more often than not. The radial menus and cursor controls work pretty well, considering the jump to consoles. I had some issues with selecting specific things, but overall I was pretty impressed with how everything translated. Outside of combat, the game offers plenty of choices in how you approach situations. There are rarely clear-cut good and bad options too, so these choices won't always be easy or even simple. Shortly into the game, you'll also get your very own stronghold that you can upgrade and defend from attackers. It's a mechanic that feels a little out of place because it's not very developed or in-depth and everything else in the game most assuredly is. The complex combat mechanics and necesscity for methodical strategy may be too slow for today's modern gamers that move at a faster pace, but I myself found it growing on me as the experience went on. A more detailed tutorial would have been helpful in terms of explaining the combat's nuances. It's not quite as compelling as the story and narrative, but the gameplay does offer plenty of strategy and tactical opportunity that you would expect from an RPG like this. 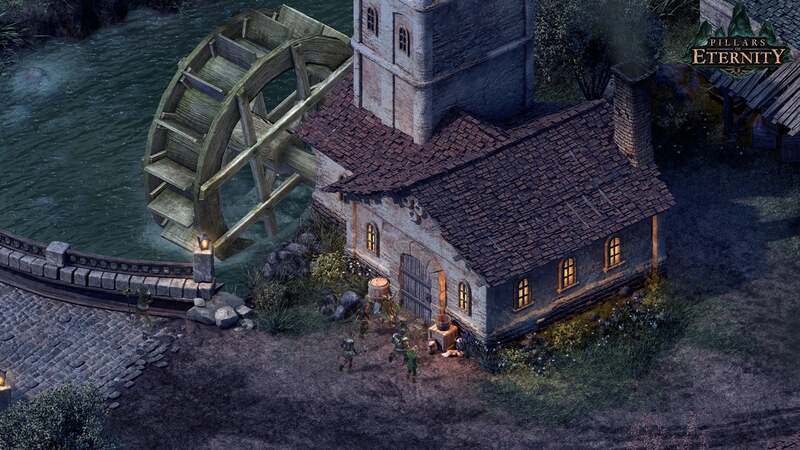 Pillars of Eternity: Complete Edition uses an isometric camera that sits above the world as you explore and fight enemies. You can zoom in a fair amount, and more of the world is revealed as you explore. The environments are pre-rendered and full of detail. Character models don't have the same level of detail, so there's a bit of a gap in the quality of the backgrounds versus the characters within them. In this regard, the game may look dated to those who are unfamiliar with this style of RPG. It's never painfully noticeable, but it is an inconsistency in the presentation most people will spot almost immediately. Voice acting, when used, is very well done with plenty of different cast members. The soundtrack stands out as a special element of the game's presentation as well. Composer Justin Bell works with the classic melodies and tones of high fantasy music, while also incorporating his own unique elements. The music always complements that situation, offering ominous undertones and heavy notes, or peppy strings and lofty brass as needed. Overall, Pillars of Eternity: Complete Edition is a faithful console version of the acclaimed PC RPG. There's no denying the value of content here, especially considering that the DLC is included in this release. The deep and complex story, combined with tough but strategic combat, and an overall strong presentation makes this well worth your time if you're a fan of the classics or just a modern gamer looking for something with more meat on its bones. In either case, these pillars stand tall.